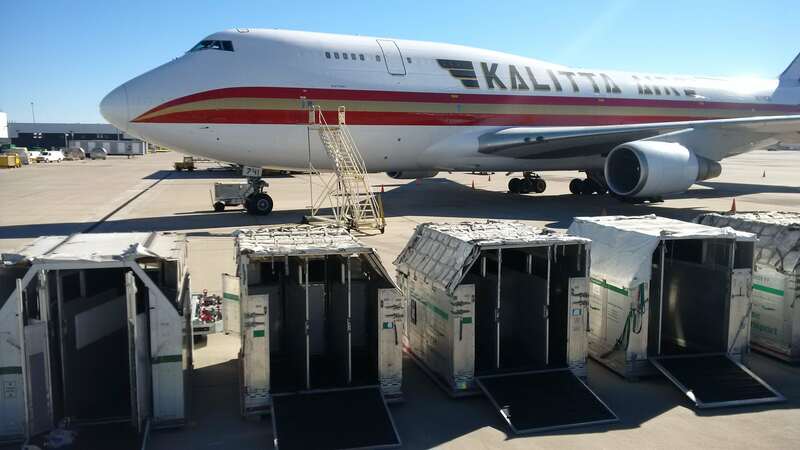 Intradco Global coordinated another successful horse charter, on this occasion moving 63 horses on a Boeing 747-400F aircraft from Denver, Colorado to Mexico. We assisted in arranging the 23 stalls in Denver in advance and worked closely with the local handling agent to arrange air-side access for the horse trucks. This allowed for all 63 horses to be moved promptly and calmly from the trucks, to the stalls and loaded onto the aircraft. Ensuring an efficient and seamless loading process when transporting large numbers of horses is paramount and requires the utmost and care and attention. The onward journey was a relatively short two-and-a-half hour flight, however, the horses drank over 120 gallons of water, keeping the flying grooms very busy during the flight. Offloading in Mexico was a swift operation, with a team of over 20 people assisting with all aspects of the offload. The stalls and trucks were positioned in a dedicated warehouse to allow for the necessary veterinary checks, which were performed smoothly.